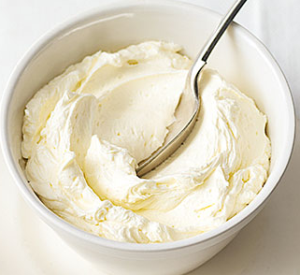 Hard sauce is a sweet, rich dessert sauce made by creaming or beating butter and sugar with rum (rum butter), brandy (brandy butter), whiskey, sherry (sherry butter), vanilla or other flavorings. It is served cold, often with hot desserts. It is typically served with plum pudding, bread pudding, Indian pudding, hasty pudding, and other heavy puddings as well as with fruitcakes and gingerbread. In the U.K. brandy butter is particularly associated with the Christmas and New Year season and Christmas pudding and warm mince pies, serving as a seasonal alternative to cream, ice cream or custard. At Cambridge, it is also known as Senior Wrangler sauce. Though it is called a sauce, it is neither a liquid nor smooth. It could be more accurately classified as a spread and has the consistency of butter. It is easy to make and keeps for months under refrigeration. It can be pressed into a decorative mold before chilling. Under European Community regulations, to be called rum/brandy/sherry butter, it must contain at least 20% butterfat.